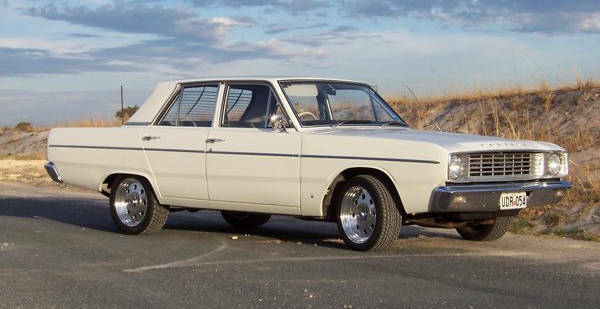 Intoduced in October 1967, the VE Valiant was an all new design, with some sheetmetal being shared with US Plymouth Valiants and Dodge Darts. 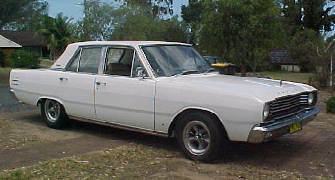 Chrysler Australia's 'squarest' body shape to date, the VE also had a longer wheelbase, was slightly larger in the body and had more interior space than it`s predecessor the VC. 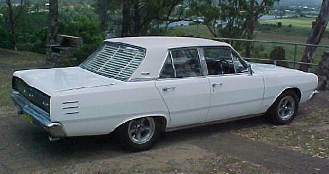 The roofline was also flattened out and the rear window was given a concave profile. As with all previous models in the Valiant line-up, higher levels of standard equipment were included, aswell as some power upgrades in the engine department. The Slant Six was retained with it`s 109kW (145bhp), but a new Slant Six with 120kW (160bhp) was also offered as an option (featuring a two barrel carburetor, revised camshaft and exhaust system), and the 4.4 litre V8 was also improved in various areas. Other improvements or changes made over the previous model included the introduction of a 64 litre (14 gallon) fuel tank, shorter gear lever throw on the manual gearbox, relocation of the dipswitch from under the brake pedal to the high left of the firewall and the windscreen wipers were finally located on the engine side of the firewall - greatly reducing their noise. All models benefited from additional safety features such as dual line brakes with a tandem master cylinder, double sided safety rims, front seat belts and front power disc brakes on V8 models. The VE range offered models in sedan, station wagon and utility versions, but new for the VE model was the high specification 'VIP'. The VE VIP used the same sedan body but featured a more luxurious interior, 273 V8 motor and also shared the 3 'sargeant stripes' of the VC V8 on the rear quarter panel. 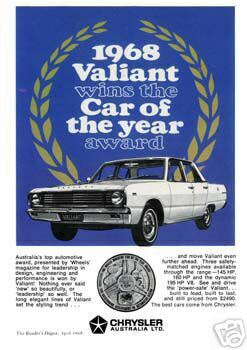 The biggest accolade awarded to the VE Valiant was 'Wheels Car Of The Year' - the first for Chrysler Australia. You can read the Wheels article here. A total of 68,688 VE Valiants were built.